There are endless possibilities of what to pair with peanut butter. Elvis was famous for his peanut butter, banana, and bacon sandwich. According to Elvis’ Uncle Vester, young Elvis could eat his weight in peanut butter and crackers. Some people like peanut butter and mayonnaise, or peanut butter and honey, but no one made a better sandwich than my childhood friend, Linda. At about age six, she introduced me to peanut butter and potato chip sandwiches. Don’t laugh until you’ve tried it. The bread must be soft and white, the peanut butter creamy, and the potato chips thin and salty. Linda and I preferred Jay’s Potato Chips. We could never get enough of these sandwiches. I thought Linda was a genius, and we laugh about how we still indulge ourselves with our childhood favorite. Peanuts were known as early as 950 B.C. The ancient Incans loved peanuts. They were introduced in our country in the early 1800’s, with the first commercial crop grown in Virginia in the 1840’s. Everyone knows that President Jimmy Carter was a peanut farmer, but Thomas Jefferson was the first president to grow peanuts. George Washington Carver, known as “The Father of the Peanut Industry,” developed about 300 diverse uses for peanuts ranging from face cream to axle grease. In his book, “The I Love Peanut Butter Cookbook,” William I. Kaufman has recipes starting with appetizers, ending with how to feed birds with peanut butter. If you love peanut butter, you will love the diversity of recipes in this book. He suggests putting peanut butter into potato salad. Now, that one I would have to taste to understand. 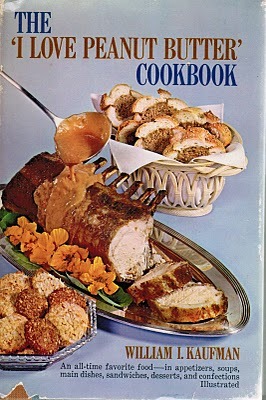 About half the book is recipes for sandwiches, breads, and sweets, but the main dish and soup recipes sound equally as good. I love peanut butter of all kinds, but I’m a little partial to Skippy Roasted Honey Nut Creamy. On white bread. With potato chips. Go try it and tell me what you think.